We have called this press conference with a sense of urgency to first, address the crisis of devastation of our environment; particularly, poisoning of our water resources by illegal miners, also known as “Galamsey” operators and secondly, to deal with the acts of terrorism unleashed on public officers and institutions by political party sponsored vigilante groups. 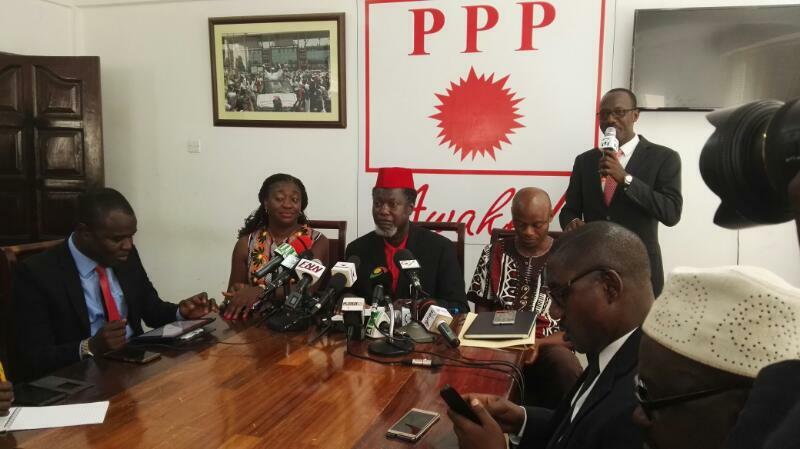 The PPP condemns in strongest terms the current lawlessness going on in our country and the clear lack of leadership by the ruling New Patriotic Party (NPP) to deal with it, as well as the hypocrisy and complicity of the opposition National Democratic Congress (NDC) as an all-time key contributor and actor in the crisis on our hands. We demand that the President takes urgent steps to stop the lawlessness with immediate effect, to save our country from degenerating into an ungovernable society and a sure candidate for failure as a state, under his watch. Ladies and gentlemen, we are all aware of illegal mining in Ghana and how that has already poisoned majority of the nation’s water bodies, degraded farm lands and is threatening to dry up sources of treatable water, to the extent that we would have to import safe drinking water in less than five years, if the galamsey menace is not stopped with immediate effect. The devastation of our environment by galamsey did not start today. It has been round for decades under the watch of both NDC and NPP administrations that have, by their omissions and commissions benefitted from its proceeds while in government but turn around to blame the other when in opposition and vice versa. It is recalled sadly, how in the heat of the 2016 election campaigns, some illegal miners in Obuasi demonstrated against a quit order from the Minerals Commission ordering them to stop gold mining within the concession of Anglogold Ashanti (AGA). The NDC, then seeking re-election looked on for the illegal miners to have their way, because it feared enforcing the quit orders would affect its electoral fortunes. Reliable information in our possession from the Ministry of Lands and Natural Resources indicates that 60% to 70% of excavators in Ghana are not used for road construction but rather, illegal mining activities. The question is; how are the excavators able to move to the mining sites without the knowledge of the Police and the security agencies? Can the NDC and NPP who have ruled this country for 25 years, say they are not aware of the destruction such illegal activities have caused to our farm lands, water bodies, forest reserves and the general health of our people? Is it true that a former Minister for Lands and Natural Resources issued licenses to the Chinese for $40,000.00? Cocoa farmers have been compelled to sell their farm lands for galamsey cash because the state has failed to guarantee the safety and security of their investments as farmers. No wonder, Ghana continues to experience a reduction of about 100,000 tons per annum in the production of cocoa, contributing to the global reduction trends expected to hit about one million tons. We simply cannot allow illegal miners to destroy our cocoa growing regions like; the Brong Ahafo, Western, Ashanti and Eastern Regions, all because some people have decided to mine outside the law, and operate their mining activities in prohibited areas in gross violation of the Minerals and Mining Act, 2006 (703). To that end, we want to commend the recently launched media coalition against illegal mining and encourage them to continue with the concerted effort to help put a stop to galamsey in Ghana. We want to assure the coalition that they have a reliable partner in the PPP as a party in opposition and PPP as a party soon to be in government. We want to send a warning shot to both private and public sector actors that the environment in Ghana is no longer their playground. We expect the NPP government to gather the political will to prosecute and extradite all foreign galamseyers from Ghana so that our farmers can cultivate more crops to improve their individual livelihoods and that of the nation collectively. Can a Ghanaian travel to China or any other country to destroy their water bodies? Will they be spared? Or will leaders of such countries tolerate our leaders, calling on their citizens who complain to order as the Chinese are asking us to do? We wish to assure Ghanaians that such unwarranted provocation and disrespect for our sovereignty will never happen under the watch of a PPP government. It is our fervent hope that the devastation caused by galamsey will not continue to be lost on the NPP administration and that they will find it necessary to deal with it surgically without fear or favour. We are giving the Akufo Addo led-government a three month ultimatum to STOP GALAMSEY operation in Ghana. Failure to do so shall compel us to drag him to the International Criminal Court (ICC) for crimes against humanity. Ladies and gentlemen, galamsey is not the only threat we live under as a nation. Since 1992, we have seen an uptick in the atrocities of political party-affiliated vigilante groups. These groups have been emboldened of late because they are said to be responsible for the NDC and NPP winning power in Ghana and government must necessarily find space for them in our constitutional democracy. Ladies and gentlemen, this degrading assertion throws up the question; where is the power of the people? Did the people of Ghana vote for change or the vigilante groups did? Why should Azorka Boys, Bamba Boys, Invincible Forces, Kandaha Boys, Bolga Bulldogs and Delta Force determine our destiny as a democracy? Do we have leadership in Ghana? And is this the change Ghanaians voted for? Ladies and gentlemen, just think about this and relate it to the impunity in Ghana today. When the former President, John Mahama granted a pardon to the “Montie Three” who were serving a four-month jail term for scandalizing the court, we (including the NPP then in opposition) rightly condemned Mahama’s poor judgment. His action of arbitrarily exercising the prerogative of mercy was a contributing factor to the defeat of the NDC in the 2016 elections. But did the NPP deserve to benefit from that change? As you are already aware, NPP’s Delta force in Kumasi, took the law into their own hands and forcibly removed the Ashanti Regional Security Coordinator from office under the full glare of Ghana Police officers. A week later, another group besieged the offices of the Eastern Regional National Health Insurance Scheme, and forcibly locked the office of the Regional Manager. Last week, the thirteen suspects of the Delta force who were sent to the KMA Circuit court were freed by some members of the group. This is tantamount to jail break. What do you think could be fueling this impunity which has reared its ugly head in our country? For how long must we continue to live in the cuckoo’s nest knowing how difficult it is to escape? In this moral dilemma we are in, should we be ruled by law or by men? Where in the world can a vigilante group besiege a court premise and take custody of accused persons? If the Chinese and other nationals resident in the country hear such stories, why would they not behave the same way? We understand that in our criminal justice system, the government retains broad discretion as to whom to prosecute. But this does not also mean that we should allow ourselves to be haunted by the stark images of desuetude, impunity and abuse of power. Any country where political party sponsored groups are more powerful than legally sanctioned security officers, and agencies can be likened to the Anarchist Republic of Cospaia. The blunt truth is that we must end this jocular depiction of the survival of the fittest principle we want to create in Ghana. We need to be mindful of the type of country we are gradually building. It is unacceptable for us to even think of our country becoming a leaderless republic. Let us refuse to tolerate the Invincible forces, Delta forces, Kandaha boys, Azorka boys, Bamba boys, Landguards and all other Militia whose activities are fully funded by political parties and their agents to foment trouble in our country. Let us think about these groups and be reminded of Rebel groups in war-torn countries. We must realize that any attempt to bring in militia to deal with political opponents is bound to boomerang with dangerous consequences. We cannot allow these groups to flourish while we indirectly make the legitimate security services almost powerless. We wish to remind Ghanaians that the President, his Vice, Ministers of State, Judges, Officers of Security agencies, Members of Parliament, and all government appointees pledge first and foremost to uphold the 1992 Constitution. These oaths affirm that the rule of law is superior to the rule of any human leader. We should be careful not to allow Political party militia and vigilante groups to be seen as “untouchables” in our country. This is shameful and our country urgently needs leadership to act decisively in this situation. Ghanaians should not be deceived by this “by-force duopoly” as the accepted form of democracy and expect any different performance from the government they vote into power. During the 2016 campaign, we warned Ghanaians that real change would only happen if we voted for the PPP and that voting for either of the two would bring chaos. The truth is, we get what we vote for! We demand that the Inspector General of Police (IGP), Mr. David Asante Apeatu, disbands all political vigilante groups in the country to put an end to the growing act of lawlessness being perpetuated by these groups. Formation of vigilante groups by political parties is not backed by any law. Hence, political party-affiliated vigilante groups are illegal entities that must not be allowed to operate. We should recall that in January 2016, the then IGP, Mr. John Kudalor assured Ghanaians publicly of the police service commitment to disband all political party-affiliated vigilante groups. Yet the police service failed to dissolve a single vigilante group. What is happening now is a result of the failure of the Ghana Police Service to honour its promise to disband political party affiliated vigilante groups in the past. We must take a cue from the Nigerian experience, where a small politically motivated vigilante group formed to frustrate opponents has become terrorist group (Boko Haram) wreaking havoc on innocent people because no effort was made to dissolve it. The Progressive People’s Party will not condone any act of lawlessness from any vigilante group in Ghana. Enough is enough, many people have suffered at the hands of vigilante groups, and it is time to dissolve them. Ghana will not be a breeding ground for terrorist groups. We therefore, demand that, the IGP immediately disband all political party affiliated vigilante groups, and arrest and prosecute members of the groups culpable for causing harm to innocent people and damaging state assets. Political party vigilantism MUST STOP NOW!!! God save our homeland Ghana and make our Nation Great and Strong!